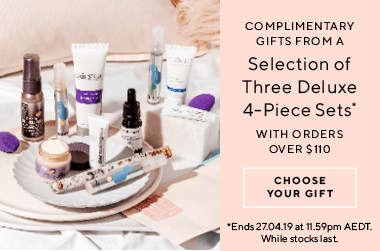 Give the gift of beauty! We have gifts for everyone and every occasion - birthday gifts, Valentine&apos;s Day gifts and Mother&apos;s Day gifts. We can send your gift with a handwritten card, directly to the recipient. Choose your gift card at the checkout. Showing 20 products of 103. I harshly bleached my hair from dark box dye and it was so weak, dry, frizzy and not smooth at all! And I knew Olaplex was good but I didn&apos;t know it was this good! My hair has never been softer and hydrated! Philosophy Pure Grace is exactly as described, with a light, fresh scent that isn&apos;t overpowering but strong enough that you know it is there. The cleanser is great, foams well and makes you feel clean. The moisturizer is quite light on the skin, and doesn&apos;t feel greasy. I have started using the perfume as my daily go-to, and would definitely purchase this pack again - it&apos;s worth the money!